I was gossiping with my friend Griselda about a couple of very successful Australian businessmen we know for whom Communism/socialism represents good and America evil. The overwhelming problem they see in the world is America and believe that it must be stopped without for a moment recognizing any connection to their own genuine skill in the black arts of capitalism. The quality of their belief is so passionate that it sometimes extends to seeing Ahmadinejad and Chavez as the good guys. 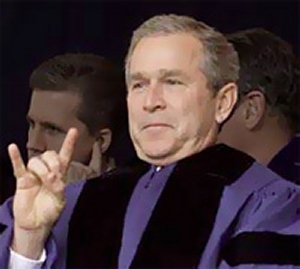 The former is the President of the country that regularly refers to the US as the Great Satan and the latter actually called Bush the devil in this speech before the UN. Griselda and I both see this phenomena as a kind secular faith. She is fond of quoting Chesterton “When people stop believing in God, they don’t believe in nothing — they believe in anything.” The part about believing in nothing is important. Unless one is brought up, like a Theravada Buddhist, to believe in ‘the void’ it is difficult to stop thinking in terms of one system of symbols, in particular those for good and evil, without replacing it with another one. Consequently, it is unsurprising that the early Christians appropriated the dates of many Pagan festivals and built churches on Pagan sacred sites. Today I think modern secular people often replace Christian symbols and beliefs with overtly or unconsciously Marxist symbols and beliefs. 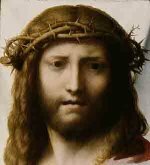 A very obvious such segue in the conceptual realm is millennialism – the remarkable resemblance between the Christian belief in the ‘end times’ and the Marxist belief in the stateless paradise at ‘the end of history. Even neo-conservatives hailed the fall of communism and the globalization of capitalism as the ‘end of history’ until our Muslim friends disabused them of the notion. Likewise, our Green friends would get a lot further with me if they lightened up on the apocalyptic fear. But I digress. In this post I want to show how this confounding of old and new beliefs is more obvious – more florid one might say – in the realm of visual symbols than in the arena of verbally expressed ideas. Chavez’s verbal thrust is extraordinary – visual sallies not so much. Google images is a great tool for exploring the visual. I look not only at the specific images but also at the number and character of them. For example, when you put Bush into Google images the ratio of negative to positive pictures is overwhelming. Outside of a couple of official portraits almost all are negative. I’m not claiming this result is manipulated – although it may be in obscure geeky ways I am not aware of. What I think is going on is that intense negative sentiment is producing large numbers of images, while those that support him are not equally motivated. If you give Hillary Clinton a go you will see she does a little better but cops a lot of visual flack too. Leaving Chesterton’s argument for God aside, I think it is fair to say that, as we have become less religious, it is only natural that we begin to use secular symbols for good and evil. What is just beneath the surface is that the modern replacement often bears a striking resemblance to the old system of symbols. 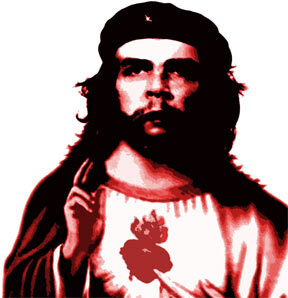 We have this juxtaposition of the iconic photo of Che with Christ. The second image is from Germany where anti Bush sentiment is particularly strong. 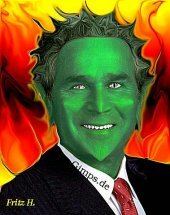 Below is a full dress Bushdevil complete with Biblical quote from a well done anti Bush site that visually explores the whole gamut of anti Bush memes from Bush Hitler to Bush Chimp. 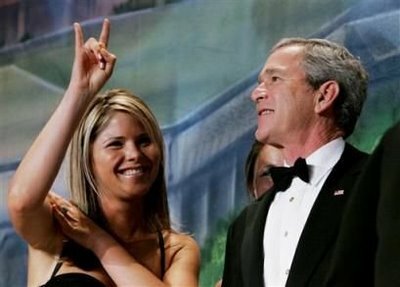 A variant I particularly like is the mock conspiracy theory ploy showing Bush giving the left handed devil’s horns sign. I presume these shots are either accidental moments caught by the camera or photoshopped. Even his daughter Jenna gets in on the act while her granddad, Bush 41, seems to escape this fate – evidently it is just Dubya who is the ‘bad seed’. Bluntly, Che was not the potential savior of mankind, but a charismatic Stalinist quite prepared to execute his political enemies. 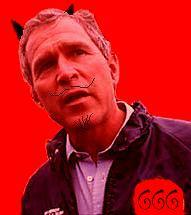 Nor is Bush the avatar of evil but a controversial American president who’s place in history is yet to be determined. In their day, The Romans solemnly made gods of their emperors, then routinely slaughtered them, threw down their statues and declared their divinity null and void. 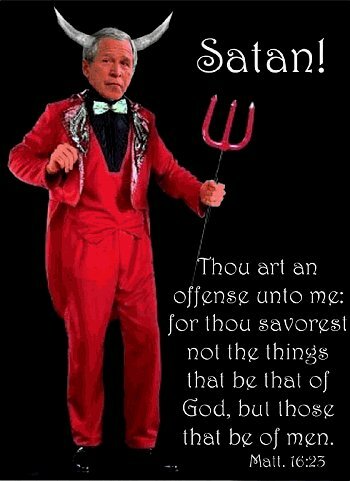 Projecting heaven and hell on our leaders is good sport, but as the Romans discovered a dangerous one.